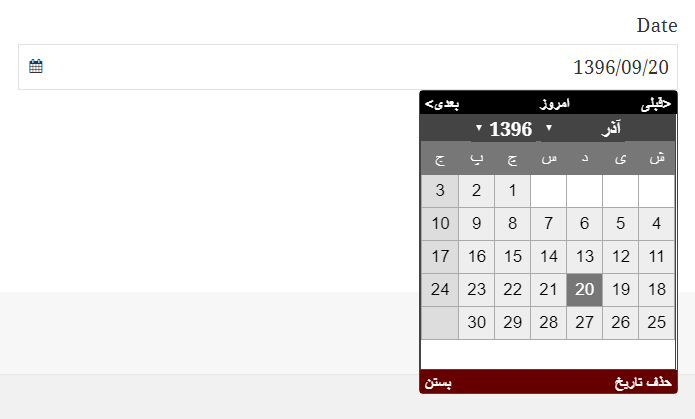 The Date element in Quform does not support the Persian Solar Hijri calendar but using a script you can attach a calendar/datepicker to a Text element. Add a Text element to the form, in the Settings on the Styles tab you can set a calendar icon on the field if you wish. Visit this page and click the Download now button to download the package. Extract the downloaded zip file, and upload these files from the package to the wp-content directory on your server. Add the following code to the theme functions.php file (or create a plugin for it).